This classic southern combo couldn’t be more comforting. 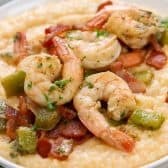 Cheesy grits are topped with bacon, peppers, and juicy shrimp to create a mouthwatering dish you will not just have one bowl of! Bring water, chicken broth and garlic powder to a boil in a medium pot. Add grits and cook for 18-20 minutes or thick and creamy (or follow times listed on your grits package). Remove from heat and stir in cheese and butter until melted. Meanwhile, chop bacon. Fry in a medium sized pan until crispy. Remove from pan leaving drippings in the pan (should be about 1 tablespoon). Saute onions in the bacon grease 3-4 minutes or until slightly softened. Add bell peppers and cook until tender, about 3 minutes more. Remove the peppers and onions from the pan and set aside. Toss the shrimp with garlic powder and Old Bay seasoning. Cook in the pan 2-3 minutes on each side. Add onion mixture back in along with lemon juice and parsley. Serve shrimp mixture overtop of grits. Garnish with crumbled bacon, parsley, and lemon wedges. If using quick cooking grits reduced cooking time to about 10 minutes or until creamy.